My first job out of college was as a caseworker for my county's Children, Youth and Family services. Yes, the people who investigate abused kids and yank kids from unsafe home situations. They also do amazing things like coordinate adoptions and foster families as well as provide respite and other services to people in the community. I was on a less-intense unit that provided services to teenagers who had home issues but were also on probation. Working with me was a part of their probation contract. It was hard work, and at first I really enjoyed it. But over time, it became tiring. The paperwork, reports and court appearances piled up. And I felt that even after a few years, I was struggling to really find a groove. After the 3 year point, I started dreading work and I became disheartened when past clients came back on my roster. What good was I really doing? And what was wrong with me that I couldn't be more successful in my work? I left this job for a brief stint with a faith-based non-profit whose focus was high school kids. I had worked with this organization as a volunteer for several years, and it had been my dream to go on staff with them. I was assigned to a difficult position in a fledgling area with structural and economic issues. In some ways, I felt set up to fail. But shortly after taking up the assignment and moving, I found out I was (unexpectedly) pregnant with Chica. And in this area plagued with difficulties, it was an uphill battle. I was constantly frustrated that I wasn't excelling at this job, a job I had dreamed of working for half of my life. When Chica was born, Hubby and I were on the same page that I'd stay home with her. I grew up with a SAHM mom, and I guess I'd always assumed that is what I would do when I had kids. Yet, I was not prepared for the lifestyle. To outsiders, the stay-at-home life seems luxurious: lazing around the house with your sweet babe, tackling household tasks with the greatest of ease. If only this were the case. I was rudely awakened, when after 3 days home with Hubby he went back to work and I was facing my days (and a new baby) alone. Alone is a word that would best describe my first few months as a new mom. I was bewildered by this wiggling, crying, pooping charge that had been left in my care. I had no idea how to juggle the baby's needs with the daily tasks of cleaning, laundering and getting meals made. Hygiene went out the window. For the life of me, I could not get a handle on taking care of myself as well as taking care of my house and another human. At the time, there were few people I knew who were home with kids, so I just felt lost. Once again, I felt like I was working at a job I was not cut out for. Yet, this was my new life. It took several months to make the transition from "working" to "stay-at-home." And it was a dark road. I eventually eased into my role as Momma, and even went on to have baby #2 a few years later. The truth of the matter is that every mother, whether she is open about it or not, struggles. Some struggle more than others, some hide it better. But we all struggle: with the ups and downs, with the needs, with the responsibility. And, above all, the notion that you were in the process of royally screwing up your children. And it is in a job field I feel like I do well in, which makes for happy working. In taking on this work, which has reached a level of fulltimeness (a phrase I just coined here and now), I feel the familiar strings of ineptness being pulled. I find myself worrying about my performance, if my clients are happy, or if I am in jeopardy of losing work. Being an independent contractor is wrought with uncertainty and instability. My workload changes from month to month. Some months, I am happily overwhelmed, while others I am looking for new work opportunities. And in this, I hear the voices whispering that I am unqualified, ineffectual and temporary. So for a while, now, I have struggled with the notion that something is wrong with me. That perhaps I am not really good at anything, that I am not cut out for work. I ruminate on this often. But I was recently struck by a thought that has changed my perspective. Yesterday, I was running with two friends, and we were talking about parenting stuff. My one friend was reminiscing on the early months of being a new mom, and how she wished she could go back to live it out differently, now that she knows more. She remarked, "I was just so worried all the time. I was so afraid I would mess up." And a light bulb clicked for me. I've spent the better part of my life being afraid of messing up. I live in a constant fear of failure. At my first job, I couldn't just except that I was working in a position that was not a good fit for me. Or that at my second job, the circumstances of the area where I was working were outside of my control. The only option in my mind was that there was something innate to my being that was messing up. I assumed something was wrong with me. I only felt this driven home when I took on the role of being mommy. I spent so much time worrying, so afraid I would mess up yet another "job," and this one being a person! I couldn't embrace that all jobs come with difficulties. I couldn't believe that everyone struggled. Rather, I wallowed in what I felt was my unique ineptitude. 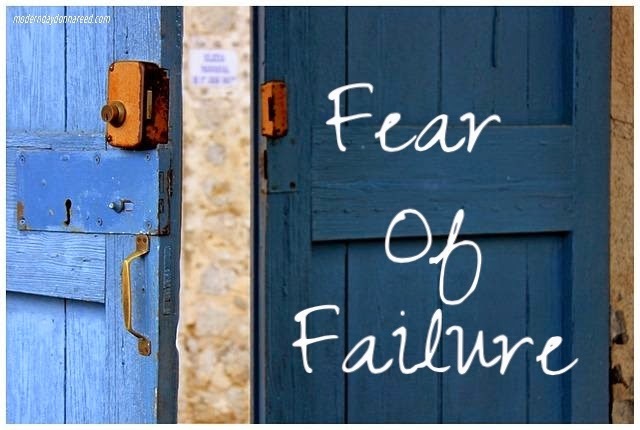 I fear failure because I believe that failing means I am flawed, ineffective, broken and incapable. But this isn't true. We all struggle in our various roles in life. We all doubt ourselves or get anxious about our job performance. Most people can embrace that they are not suited for some roles are, or accept that all jobs come with difficulty that just needs to be faced. I, instead, believe the lie that if something isn't working, if something is hard, it's my fault. Which leads to me being very hard on myself (and a heaping load of anxiety to boot). This kind of thinking can easily sink a person. The truth is: No one is suited for all things. I'm not suited to be a chemistry teacher or a financial advisor or an artist. I'm not skilled in those ways, just as people in those roles may not be suited for writing or social media. Some mothers feel they are at their best when they can stay home with their kids. Others need the professional outlet of working to feel balance in their life. I'm learning that it's okay to mess up sometimes, that mistakes won't sink me. I won't always parent perfectly. I will make plenty of grammatical errors in my writing. I will have to face clients who are, for whatever reason, dissatisfied with my performance at times. These are opportunities to learn and grow. I could let my fear of failure completely overcome me. I would be sunk. It could completely paralyze me if I let it. Instead, I can turn this flaw into a strength: to be better, to learn from my mistakes, to have grace with others, to empathize, to grow. Whether you are a stay-at-home parent struggling in the role of mommy (or daddy) or doubting yourself in your role at work, embrace this truth: there is no such thing as failure. There is only the opportunity to learn and grow. Let mistakes make your stronger. Let difficulties give you a tender heart to others who struggle. There is no option to fail.